There are some straw bales in my wood which I use as a Boss when the weather allows. The wet winter made me wonder whether they were past their sell by date, and when we pulled the plastic sheeting off to look, this proved to be the case. However it also revealed two species of fungus! 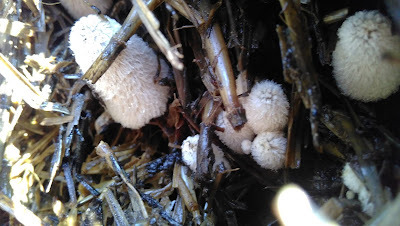 There are around 60 spp of Coprinopsis in the literature, however excluding those found growing on soil etc greatly reduced the possibilities. In the end it came down to two possible candidates, C. macrocephala and C.radiata. Both are remarkably similar! Firstly it has a significantly larger cap size - these were around 29mm. However, as Buczacki points out, there are some collections which actually contain unusually large specimens of C. radiata. So secondly, and more conclusive, is the fact that the spores of C.macrocephala are significantly wider. As the picture shows the majority of these spores were over 8µm wide. Finally, looking on the FRDBI, there are a number of records for C.macrocephala on decomposing straw, whilst the majority of records for C.radiata appear to be on dung. I'm happy to be corrected, but on the balance of probability it would seem more likely these are C.macrocephala. If correct,this is the first record for the species in Wales. Not much about so good to reveal a hidden specimen. This would seem to fit OK. Watling says -- habitat on manured straw or dung heaps, less frequently on fresh dung. Recognised by rather coarse veil fibrills and lack of marked swollen or rooting base. The pic shows a rather coarse veil.